In the never-ending quest to attract top talent, smart organizations are using technology to help attract the right people to the right roles. From scanning resumés for keywords to using behavioural analytics to assess a candidate’s cultural fit, technology can improve the process in many ways. However, organizations often overlook the very first step in the talent acquisition process at the top end of the funnel, where perhaps the greatest impact lies. Instead of producing a video that merely highlights corporate key messages, why not provide prospective candidates with a video that helps them access everything they need to make an informed decision about applying to the organization? The right information at the right time helps a jobseeker self-assess for the right fit. Taking a candidate-centric approach at the top of the recruitment funnel requires a different strategy. Using video to engage prospects and describe the organization’s culture is arguably the best option because this medium most closely mimics the most powerful form of communication — face-to-face. In the intense competition for the best talent, companies must use creative recruitment tools to first attract and then engage qualified candidates. And because video content is highly ranked by Google algorithms, a video will also help a company get out in front of a larger pool of talent. But does every jobseeker have the same needs and desires? No, each candidate has specific reasons for their employment search and wants particular questions answered. Although conventional video can be powerful, it is fundamentally limited. With traditional linear video, an employer serves up content in the order it deems most important to jobseekers. But, more often than not, the order reflects what is most important for the organization, not the viewer. The jobseeker, on the other hand, presses play and expects to receive value in the next 30 to 60 seconds. If she doesn’t, she abandons the content and may never come back. In today’s digital world, everyone expects a higher level of choice, so it’s about providing a video experience that is tailored to the individual viewer. It’s a best-of-breed blend between the functionality of a microsite and the powerful engagement of video. Imagine a video that allows the viewer to select the topics he wants to watch and when — to download an annual report or click to access top-line benefits details. Offering this kind of choice provides multiple benefits including greater click-through and engagement rates. Engaging viewers with content they actually want to watch can increase the chances of them completing the entire video. Corporate culture is often paramount when deciding whether to join a company, especially for millennials, but typically it is not experienced until much later in the recruitment process. By allowing viewers to actively select the content they want to watch, interactive video turns jobseekers into active participants. And the potential candidate leads the investigation while not usurping the resources of a recruiter, in-house HR professional or other team member. For example, Rand Worldwide was challenged with filling sales positions at its Canadian and American operations. Advantis Interactive Video researched both the potential candidates’ needs and the organization’s core values so it could blend these together into enticing content streams. Armed with these insights, Advantis then interviewed employee brand ambassadors from different departments who were willing to share personal stories that would resonate with potential candidates. 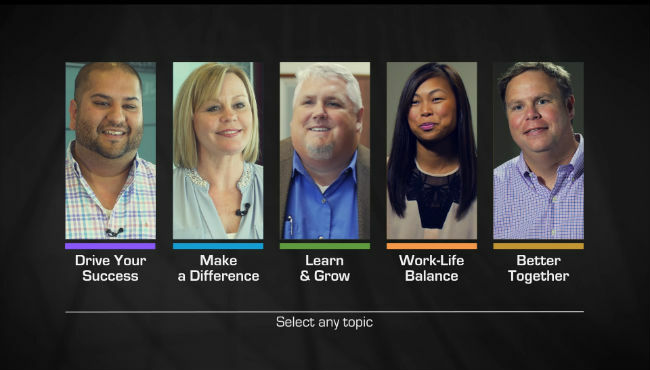 Instead of watching a typical overview video filled with platitudes about the company, potential candidates can now choose to learn about the specific topics that appeal most to their personal situation — such as work-life balance, teamwork or contribution to community — and search the open positions at any time during the video. A call-to-action screen also links directly to the career portal. And when it comes to analytics, interactive video provides more data-based insights because every time a viewer takes an action, such as choosing a story to view, downloading a document or clicking on a link to visit a web page, it’s trackable data that tells a story about what matters most to recruits. Sharing newly gleaned insights about what jobseekers are interested in with other departments can also help elevate the value HR brings to an organization. Developing the right strategy and tactics for a talent acquisition interactive video means developing SMART objectives and truly understanding your audience. In fact, this approach should be the foundation for every video project. But, all too often, the objective for a video isn’t well-defined. If the outcome is unclear, the ability to accurately assess the return on the investment becomes more challenging. To understand the ROI on a talent attraction video, the campaign objective needs to be crystal clear by detailing what the employer is trying to achieve. Will it gauge success by the number of qualified applications submitted or the speed to fulfill an open position? What is it ultimately trying to achieve for the business, and within what time frame does this need to happen? With a candidate-centric approach, it’s important to remember these are unique individuals and not bots filling vacant positions. To create compelling content choices for the viewer, we need to understand their pain points and their motivations for landing the job or starting a new career. Serving them the information they’re looking for in an engaging format will enable them to become better-informed about the organization and self-identify if they’re a good fit. This critical self-assessment saves the HR team countless hours and should provide a consistent flow of highly qualified and genuinely interested candidates. And if they learn more about the organization and determine it’s not the right fit, it’s still a win-win situation because HR resources aren’t being wasted fielding questions from candidates who aren’t the right fit. Leveraging new video technologies can greatly increase efficiencies and help bring qualified candidates through the top end of the funnel so they’re ready for the next stage in the vetting process. In today’s digital world, employers should take advantage of appropriate technologies such as interactive video to more effectively and efficiently secure higher quality candidates who are the right fit. Cyrus Mavalwala is founder of Advantis Communications, a digital communication agency integrating traditional, video and social strategies. He can be reached at (416) 848-1885 or cyrus@advantiscomm.com.